“I didn’t feel that happy, warm and fuzzy feeling that moms expect until almost two weeks after Rachel was born,” says Epic developer Teri Angell about her first delivery experience. Teri had a tough labor, and baby Rachel spent 36 hours in the NICU. Even after she went home, Rachel needed some extra trips to the doctor during that first week—a thirty-minute drive each way—which meant extra stress for the recovering mom and baby. “We were just exhausted,” she says. “And just as I was starting to figure it out, I got sick—another trip to the doctor’s office.” Even though Teri has access to great healthcare, both she and her baby experienced delivery challenges. 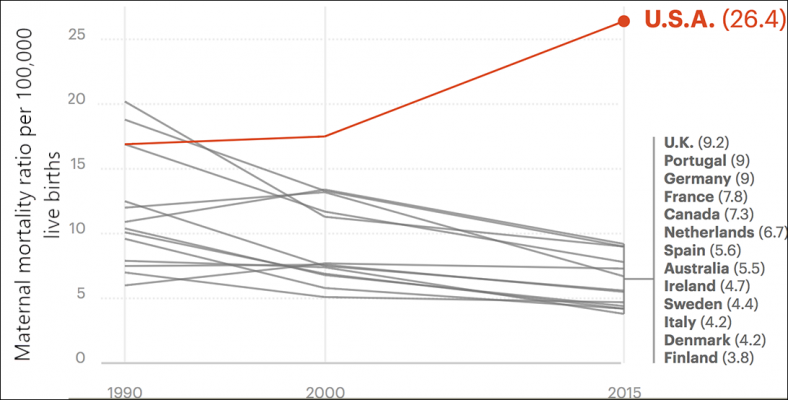 Maternal mortality is rising sharply in the United States, which already has much higher rates than other countries, as shown in the graph below from NPR. Women of color especially struggle with pregnancy and delivery risks, and about 40 black women die per 100,000 births, compared with about 26 women overall. And mortality is only part of the story—for every maternal death, about 75-100 more moms face poor delivery outcomes like Teri’s. Teri is part of a team at Epic working to keep moms and babies safe. “Our big goal is to help reverse the trend of maternal mortality in the United States by 2020,” she says. To help reach that goal, the team is connecting organizations to share and collaborate on bundles of in-system maternal safety tools, which they’re calling “bundles of joy.” They’re also creating metrics that organizations can use to track pregnancy and delivery outcomes and developing machine learning tools to help identify moms with a higher risk of complications. Epic community members can read more in Epic’s Saving Mommies newsletter. “Why We Do What We Do” is a series of stories from Epic staff about how their work relates to their personal missions to help our community members serve their patients and transform healthcare delivery. Photo: Teri’s two kids, Zach and Rachel.